Judging by recent search terms used to get to this blog and the relative recent peak in traffic, readers have been searching for this post. I wanted to wait a little longer into the month so that I could capture the expected Arctic minimum, which officially occurred on the 16th of September. The NSIDC announced this date, after which I started gathering the plots that are found below. This post will be longer than it usually is because this year’s minimum shattered the record minimum set in 2007, which shattered the previous record set in 2005. Most of the post is made up of figures, so I encourage readers to at least view them to get a good picture of today’s conditions. I’m purposefully framing things this way to relay the truly stunning situation the Arctic is in today. 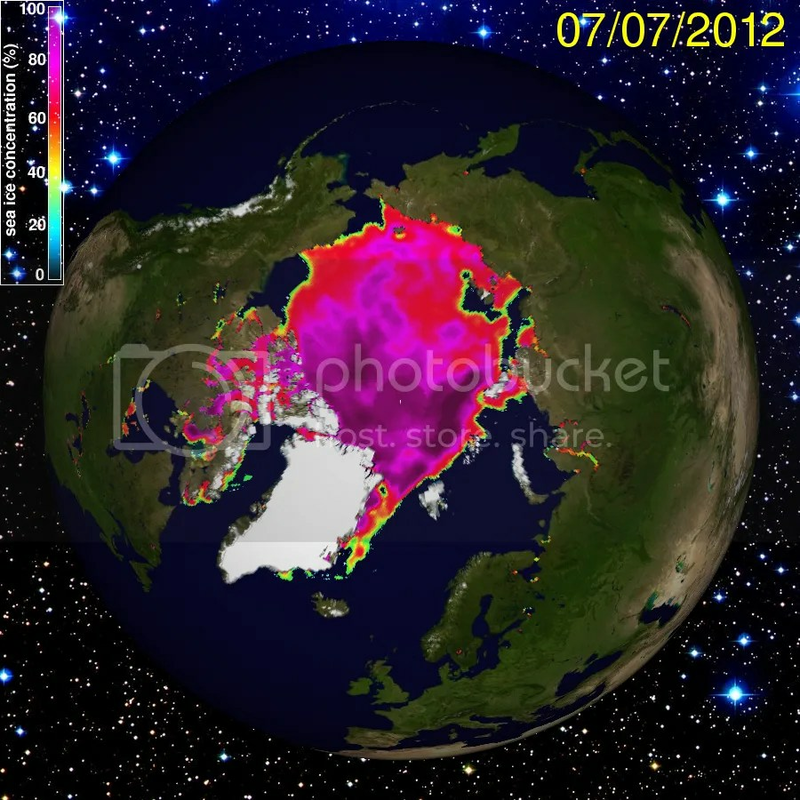 2012 is additional proof the Arctic cryosphere is searching for a new stable point, but hasn’t found it yet. That does not bode well for the rest of the globe. With that, let’s begin. The state of global polar sea ice area in mid-September 2012 remains significantly below climatological normal conditions (1979-2009). Arctic sea ice loss is solely responsible for this condition. In fact, if Antarctic sea ice were closer to its normal value, the global area would be much lower than it is today. Arctic sea ice melted quickly in August and the first half of September because it was thinner than usual and winds helped push ice out of the Arctic where it could melt at lower latitudes; Antarctic sea ice has refrozen at a faster than normal rate during the austral winter. Polar sea ice recovered from an extensive deficit of -2 million sq. km. area late last year to a +750,000 sq. km. anomaly in March 2012 before falling back to a -2.2 million sq. km. deficit earlier this month. After starting the year at a deficit from normal conditions, sea ice area spent an unprecedented length of time near the -2 million sq. km. deficit in the modern era in 2011 (i.e., almost the entire calendary year). Generally poor environmental conditions (warm surface temperatures and certain wind patterns) established and maintained this condition, predominantly across the Arctic last year. The last time global sea ice area remained near 19 million sq. km. during May was in 2007, when the Arctic extent hit its modern day record minimum. The maximum in the boreal spring the past two years was ~19.5 million sq. km. Conditions were prime for another modern-day record sea ice extent minimum to occur in September. Specific weather conditions helped to determine how 2012′s extent minimum ranks compared to the last 33 years, but it was the overall poor condition of Arctic sea ice that contributed to this year’s record low values. According to the NSIDC, weather conditions only somewhat aided rapid melting across the Arctic – a continuation of similar events in the past six years. In contrast to 2007, weather conditions played a smaller role in this year’s stunning ice melt. The extent started decreasing rapidly in August and continued through early September. Indeed, the extent set daily record lows since early August, as one of the graphs below will show. Arctic sea ice extent on in June averaged 4.72 million sq. km. Every sea except for the Greenland Sea set all-time lows during this melt season. Overall, near surface temperatures were warmer than average (by 2-5F at the 925hPa level) across the Arctic Ocean. In terms of longer, climatological trends, Arctic sea ice extent in August has decreased by 10.2% per decade. This rate is lowest in the spring months and highest in late summer/early fall months. Note that this rate also uses 1979-2000 as the climatological normal. In contrast to other months, this rate could be more negative in upcoming years, although the magnitude may not change drastically (10% is already a very large change!). Additional low ice seasons will continue to occur. Some years will see less decline than other years (like 2011) – but the multi-decadal trend is clear: very strongly negative. The specific value for any given month during any given year is, of course, influenced by local and temporary weather conditions. But it has become clearer every year that humans are actively establishing a new normal in the Arctic with respect to sea ice. This new normal will continue to have far-reaching implications on the weather in the mid-latitudes, where most people live. 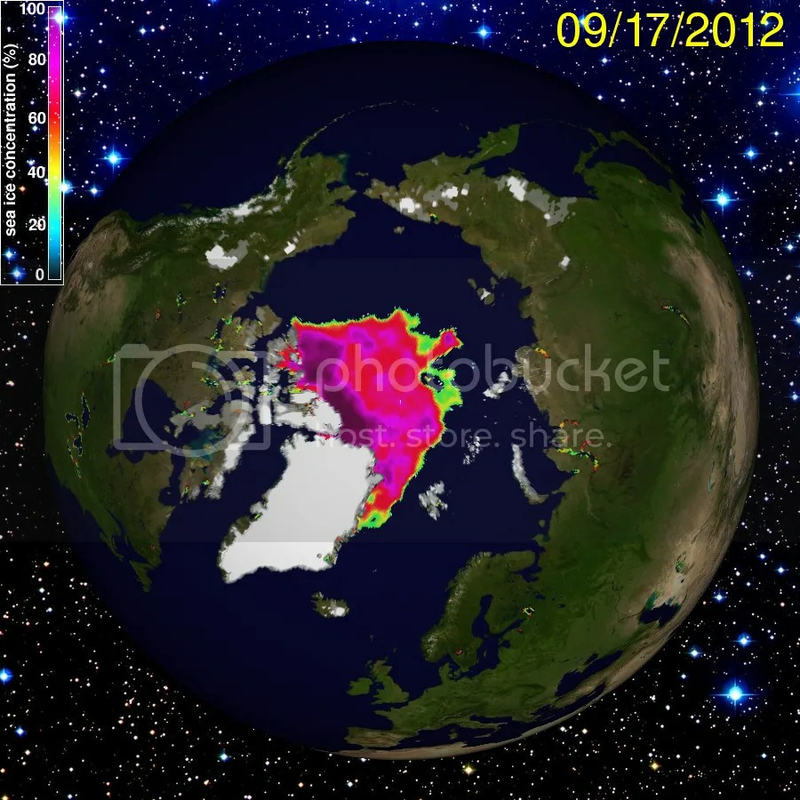 Figure 2 – UIUC Polar Research Group‘s Northern Hemispheric ice concentration from 20120917. 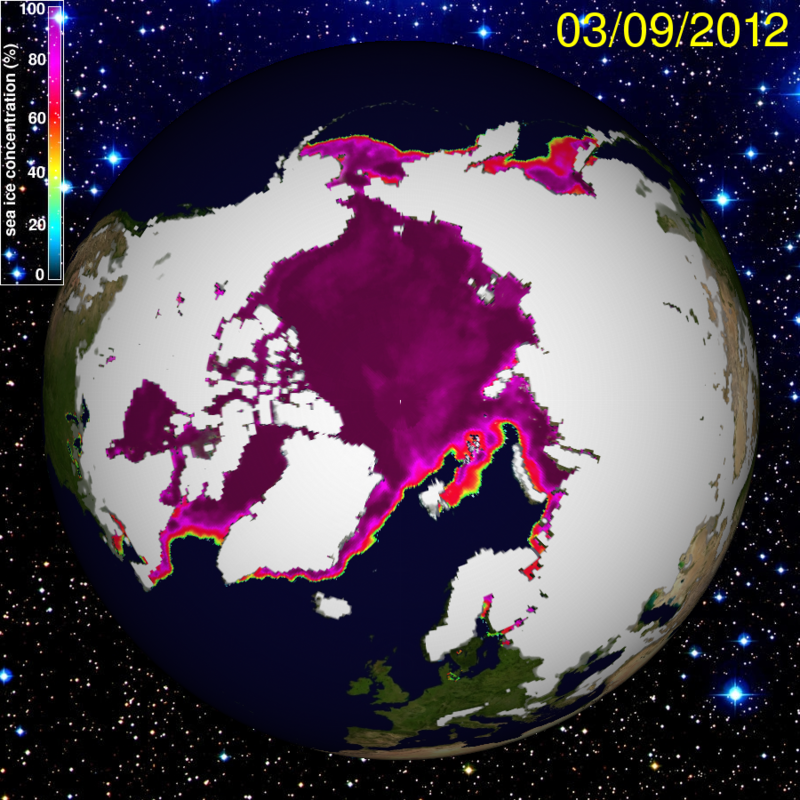 Figure 3 – UIUC Polar Research Group‘s Northern Hemispheric ice concentration from 20120309. Recall from my posts earlier this year on this topic that Arctic sea ice extent reached climatological normal conditions at a very late date in recent history (in mid-April). The conditions in March’s picture were still present in nearly the same fashion in April. The amount of sea ice that melted this year was vast – a point I will return to in another graphic below. The sea ice in multiple seas completely melted this year – some of those seas normally have sea ice in them in mid-September. Anomalously warm conditions along the Arctic coast occurred along three continents this year. Those conditions helped melt the ice near the coast more rapidly than is normal. With additional water available to soak up solar radiation (instead of ice reflecting the same radiation), the Arctic atmosphere was also warmer than usual this year. The sea ice in the Canadian archipelago and along the northern coast of Russia both melted again this year, allowing the Northwest and Northeast passages to open. This also occurred last year, when both passages opened. In my last post, I predicted that both passages would open again in 2012. That almost didn’t happen due to an anomalously strong cyclone that spun over the Arctic Ocean earlier this summer, which pushed a considerable amount of ice toward the Canadian side of the Arctic Ocean and piled up ice in other places. Alas, this year’s conditions were such that even mid-season redistribution of ice into waters that had already melted sea ice melted again. 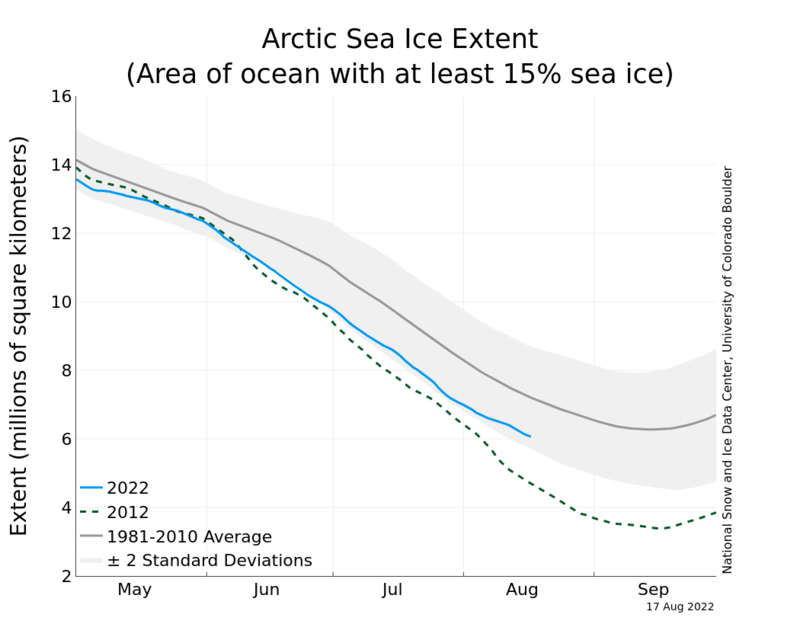 Figure 4 – NSIDC Arctic sea ice extent time series through mid-September 2012. As you can see, the extent decreased rapidly in early August, then remained at a relatively high level through the end of the month before slowing down, as normally happens, in early September. 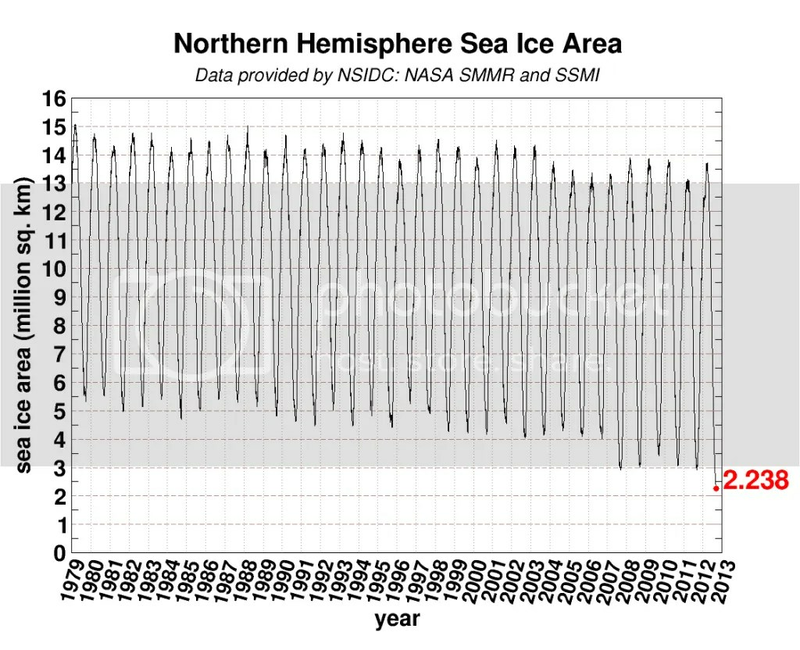 This graph is what I term NSIDC’s supplemental graph because it shows more than 2012’s time series vs. the historical mean. In this month’s version, they also plotted 2005 and 2007 – the two years which previously set modern-day record minimums. The difference between 2005 and average is noteworthy; between 2005 and 2007 is stark; between 2007 and 2012 is also stark. This leads us to examine the differences between the historical mean, the negative two standard deviation below that mean, and the 2012 value. I can come up with a number of adjectives to describe that difference, but I’ll settle with “stunning”. Half of the average historical extent is missing this year, which is much more than 2007’s minimum, which is much more than 2005’s minimum. 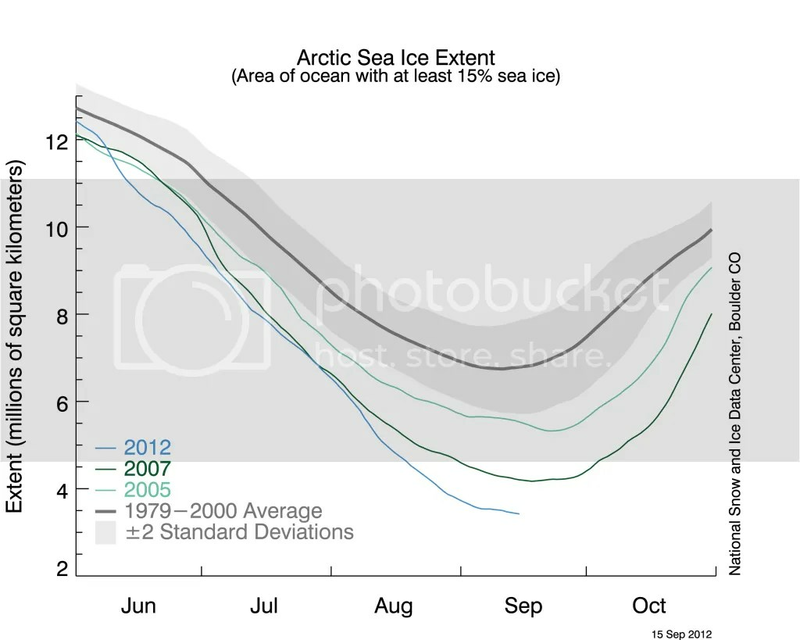 Figure 5 – NSIDC’s time series of average August sea ice extent data from 1979 through 2012. This figure shows both the annual average values of sea ice extent in the month of August but also the linear fit of that data. As you can clearly see, the fit is strongly negative – this is where the -10.2% per decade value came from that I referenced above. The sea ice can be measured along the outer boundary only or to include any missing segments within the larger body of ice. Extent measures the latter while area measures the former. At this time of year, the values are typically different. I want to show some plots showing the area – something I normally don’t do – because I think it further illustrates just how abnormal this year’s conditions are. 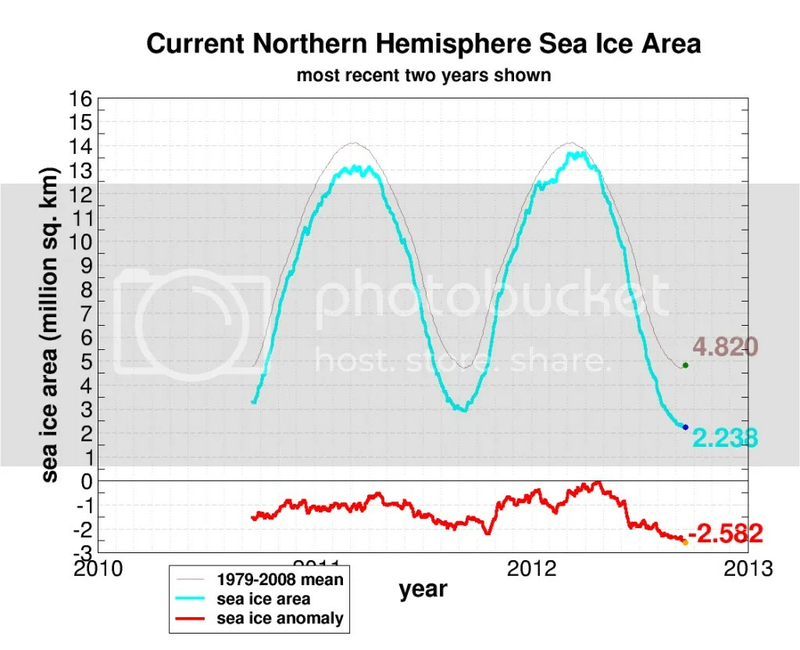 Figure 6 – UIUC Polar Research Group‘s Northern Hemispheric ice area time series from 20120918. This time series plot shows the past two years’ worth of area data (blue line), the climatological data (gray) and the anomaly (red: today’s value minus the normal value). This plot shows another way of looking at the rapid decrease in areal extent during the summer. It also clearly demonstrates how anomalous this year’s minimum is: -2.582 million sq. km. is a massive anomaly! Combined with the next plot, it also shows how much ice area was lost this year – the most on record! 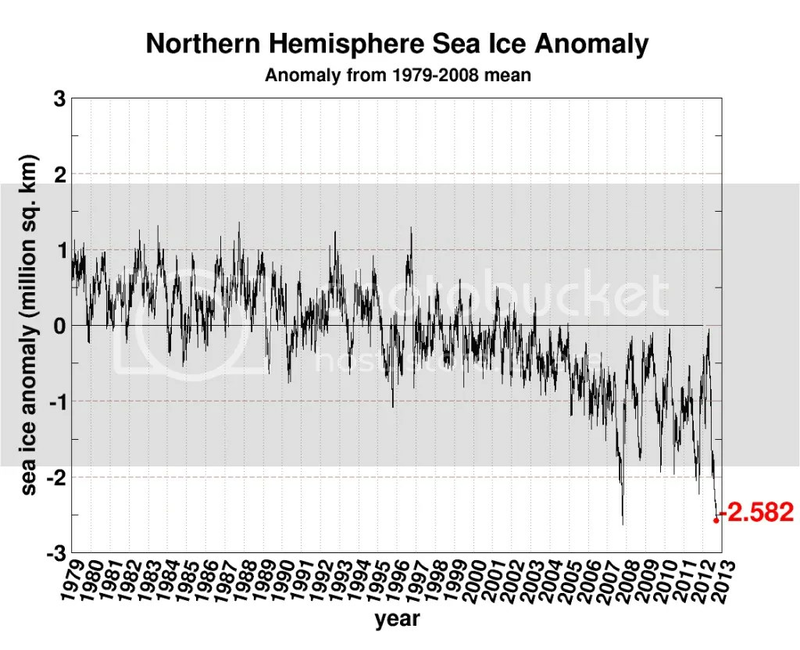 Figure 7 – UIUC Polar Research Group‘s Northern Hemispheric ice area time series for data since 1979 from 20120918. This graph shows more than just the last two years’ data, but does not show average or anomalous values. This graph more clearly shows how much ice melted starting in April – when actual conditions matched normal conditions – and how little ice remains this week in the Arctic: the lowest, by far, on record. Note that this graph shows a mini-stable point reaching from 2007 through 2011 when minima were regularly ~3 million sq. km. in magnitude. Note further that 2012 simply blew past that level on the way down toward 2 million sq. km. What do you think future years’ minimum areas will look like? Note further the typical conditions found in the 1980s: minimums ~5 million sq. km.! Figure 8 – UIUC Polar Research Group‘s Northern Hemispheric ice area anomaly time series for data since 1979 from 20120918. This graph helps show what the previous graph did not: the anomalies in the modern era. This graph needs a little more care when interpreting it. The absolute minimum anomaly value was recorded in 2007, not 2012. There isn’t anything particularly special about that observation – it doesn’t contradict anything written above. Remember, the anomaly value is calculated from a particular day’s value minus the normal value for that same day. What is noteworthy about this graph is the change from April to September: at its peak, the anomaly value this year was extremely close to 0 million sq. km. As of this week, the anomaly value is -2.582 million sq. km. The difference between those two values is the largest for any single year in the modern era. 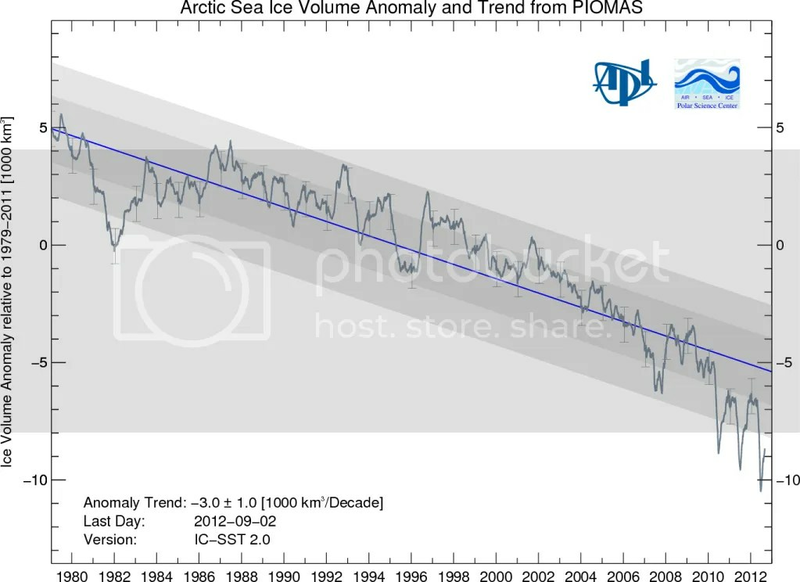 2007’s anomaly data peaked at ~-0.5 million sq. km. before hitting -2.5 million sq. km. later in the year. This year’s melt value is clearly the largest in this dataset – an observation I haven’t seen made anywhere else. Note further that in the 1980s, the annual range spanned only 1 million sq. km. anomaly – this year’s anomaly is, once again, incredibly high. 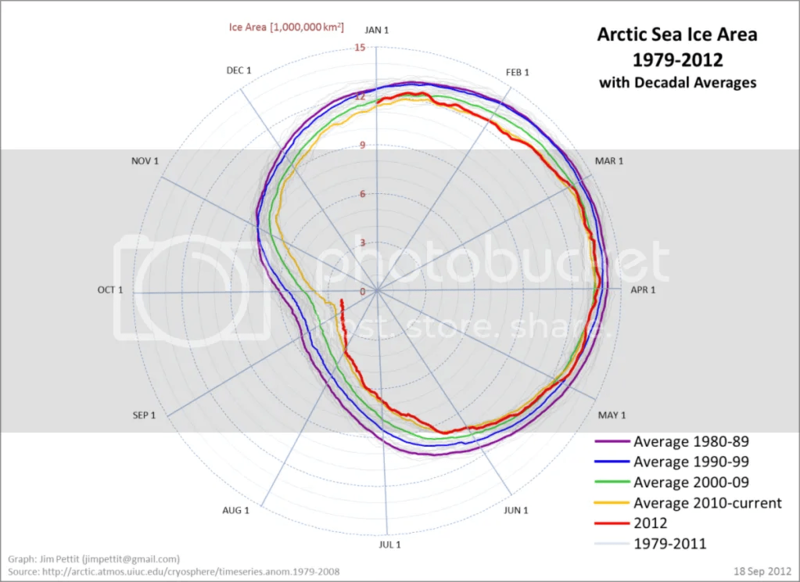 Figure 9 – Pettit’s Northern Hemispheric ice area data from 1979 through 20120918. This graph shows the same sea ice area data in a different way. 2012 is the red line, the yellow line is the average value per day from 2010 through current, and so on. This graph clearly shows the development of area trends in time: strongly negative. Figure 10 – PIOMAS Arctic sea ice volume time series through August 2012. As the graph shows, volume hit another record minimum in June. Moreover, the volume is far, far outside the 2 standard deviation envelope (lighter gray contour surrounding the darker gray contour and blue median value). I understand that most readers don’t have an excellent handle on statistics, but conditions between -1 and -2 standard deviations are rare and conditions outside the -2 standard deviation threshold (see the line below the shaded area on the graph above) are incredibly rare: the chances of 3 of them occurring in 3 subsequent years under normal conditions are extraordinarily low. Hence my assessment that “normal” conditions in the Arctic are shifting from what they were in the past few centuries; a new normal is developing. Note further that after conditions returned to near the -1 standard deviation envelope in late 2011/early 2012, as it did in early 2011, volume has once again fallen rapidly outside of the -2 standard deviation area. That means that natural conditions are not the likely cause; rather, another cause is much more likely to be responsible for this behavior. Figure 11 – NSIDC’s visual representation of the 2012 and 2007 areal extent of Arctic sea ice. The dark gray region is 2007 only areas. The middle gray identifies areas where sea ice existed in both Sep. 2007 and Sep. 2012. The white area identifies where only 2012 sea ice existed. 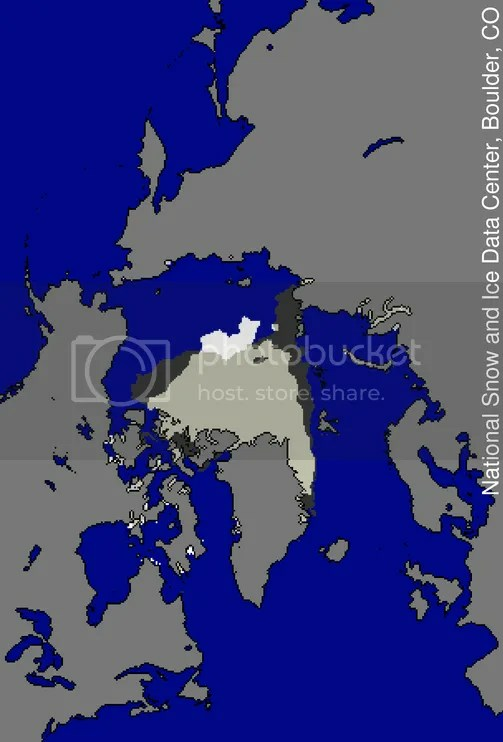 The extremely low extent, area, and volume of Arctic sea ice is likely to have ramifications for those of us at lower latitudes. Open water absorbs a lot of the sun’s incoming radiation, whereas ice reflects most of it. That absorbed radiation is stored in water as heat. In order for the water to freeze in the boreal fall and winter, that heat has to be released to the atmosphere or advected out of the Arctic Ocean by ocean currents. The additional heat in the atmosphere has to cause changes to atmospheric circulations. Researchers are hard at work to determine what those changes might be and what they mean for weather and climate patterns across the globe. Quite frankly, we’re in unchartered territory here. Our species has not lived through an extended time period with significantly reduced ice over the Arctic Ocean. 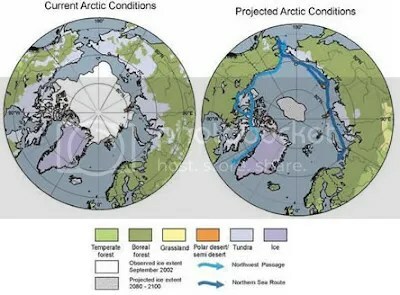 Figure 12 – IPCC projections of ice-free conditions in the Arctic. Note that the left panel’s “Current Arctic Conditions” are 2002 conditions. Figure 13 – NOAA analysis of computer model projections of Arctic sea ice. Is “by 2035” more reasonable than 2080-2100? It probably is. Is it completely accurate? It is probably not accurate in the sense that it is not a slam-dunk. It is looking increasingly likely that this momentous event will occur prior to 2035 by a good margin. 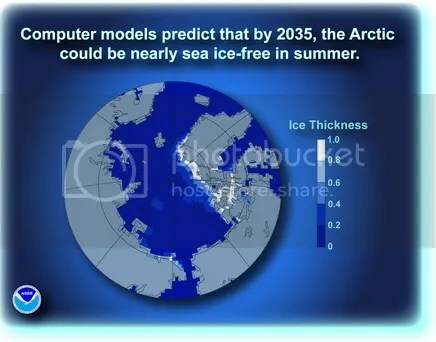 But the real question is this: if the climate models over-projected the time-frame in which the Arctic would likely be ice-free prior to the AR4, how were other Earth system projections affected by this? How much more warming or more variable precipitation will occur in the real world that was not captured in the last report? That’s one reason why research continues in this field leading up to the AR5 report, due in 2013-2014. Skeptics will gnash and scream about bias, but most of them will be blinded by their ideology: nothing the IPCC ever puts together will be acceptable to them. Unfortunately, the rest of us have to live in the highly altered world that results from the inaction into which the skeptics force us. This situation will not be reversed by paradigm shifts that are anything but. A good place to start would be designing carbon markets for success and not failure. I break from most of the science and activist communities by saying that I do not think the approaches taken in the past 30 years are sufficient to handle this problem. We cannot start with a grand bargain that includes every nation on the planet, even though this is a planetary problem. I think we should start smaller and come to agreements when and where we can, but those agreements need to be structured so that technological innovation leads us forward. In this way, economies can continue to grow and more peoples’ living standards rise. Countries have demonstrated that other approaches do not work. Figure 14 – UIUC Polar Research Group‘s Southern Hemispheric ice concentration from 20120707. 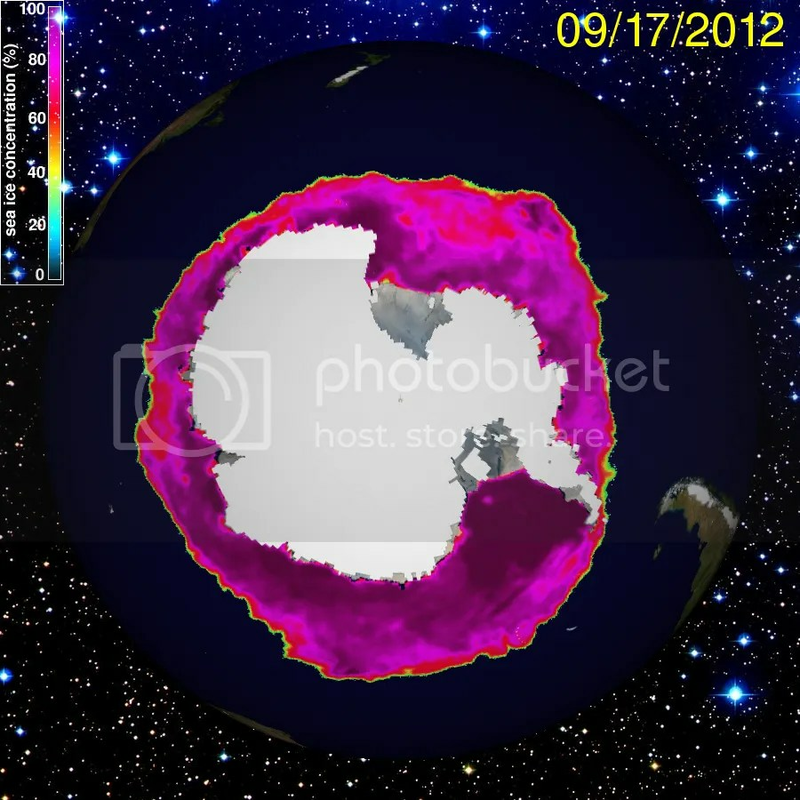 Figure 15 – UIUC Polar Research Group‘s Southern Hemispheric ice concentration from 20120917. 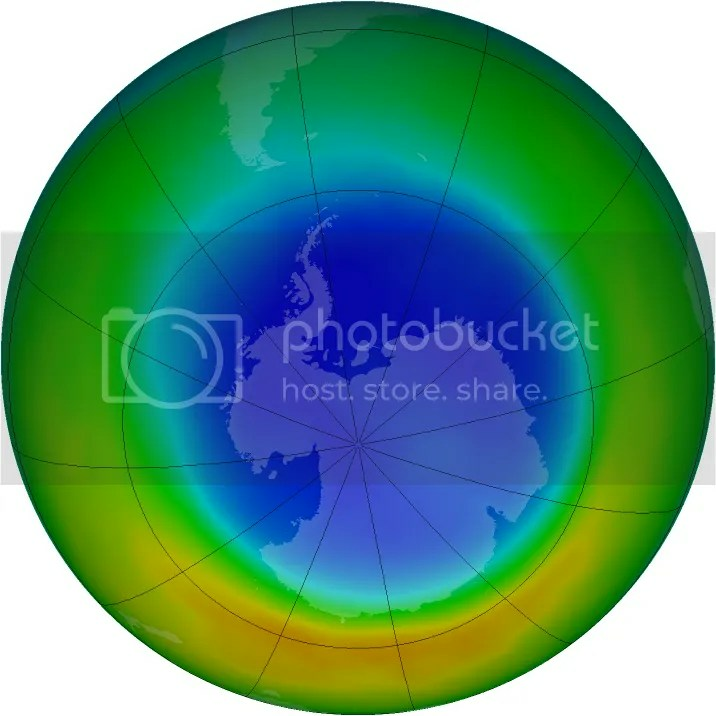 Figure 16 – NASA’s graphic of ozone concentration (Dobson units) over the Southern Hemisphere. The blue colors represent concentrations of 200-300 DU. The orange color represents concentrations of ~400DU. In the graphic above, you can see where southern hemispheric ozone depletion occurs every year at this time: over Antarctica. The map should show much more yellow and orange (~400DU), but shows almost half that concentration (blue: ~250DU) over the southern continent. This depletion has caused a colder southern polar stratosphere than it otherwise would be (ozone heats the stratosphere by transferring the radiation from the sun to molecular kinetic energy), reinforcing the polar vortex over the Antarctic Circle. That vortex has helped keep cold air in place over Antarctica that might not otherwise would have occurred to the same extent and intensity. As the “ozone hole” continues to recover during this century, the effects of global warming will become more clear in this region, especially if ocean warming continues to melt sea-based Antarctic ice from below. For now, we should perhaps consider the lack of global warming signal due to lack of ozone as relatively fortunate. Figure 17 – NSIDC Antarctic sea ice extent time series through mid-September 2012. Antarctic sea ice extent had remained at or above average to some extent through the austral winter, which is good news. The difference in conditions from the first part of 2011 to the similar time period in 2012 is obvious: NSIDC measured last year’s extent near the bottom of the standard deviation envelope while this year’s extent is much healthier. 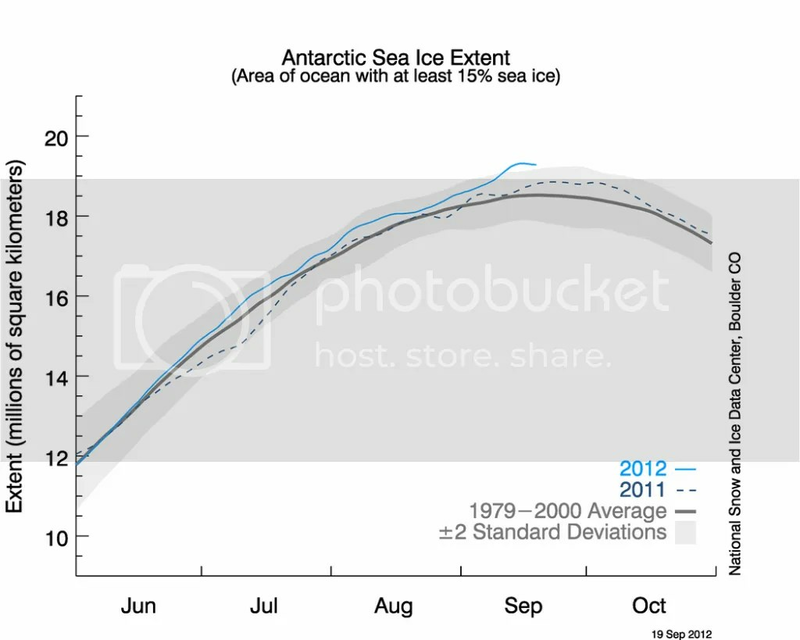 As happened in 2011, Antarctic sea ice extent is likely near its yearly maximum now. As spring takes hold over the region, sea ice will start melting any day now. Note that in comparison to the Arctic time series plot above, Antarctic sea ice extent is not nearly as anomalously high as the Arctic sea ice extent is anomalously low. Differences abound between the two poles, causing the sea ice behavior to also be different. Here are my State of the Poles posts from August and July. I will not write another State of the Poles post until early November since early October conditions will not change markedly from today. You can also find a number of other good write-ups on this topic in the blogosphere. You can find NSIDC’s September reports here. Categories: environment, global warming, NASA, science | Tags: Antarctic sea ice extent, arctic ice, Arctic sea ice extent, climate change, climate change effects, climate policy, global sea ice, global warming, ice thickness, IPCC AR4, NSIDC, policy analysis | Permalink. Thanks for all the time you have spent compiling this. 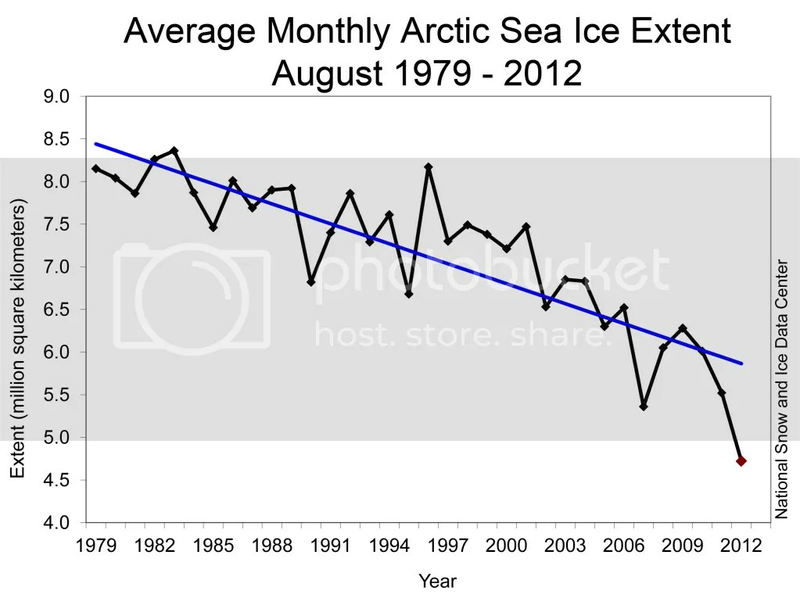 Looking at your Figure 5 (average August sea ice extent), your straight-line graph would imply no sea ice by 2032. 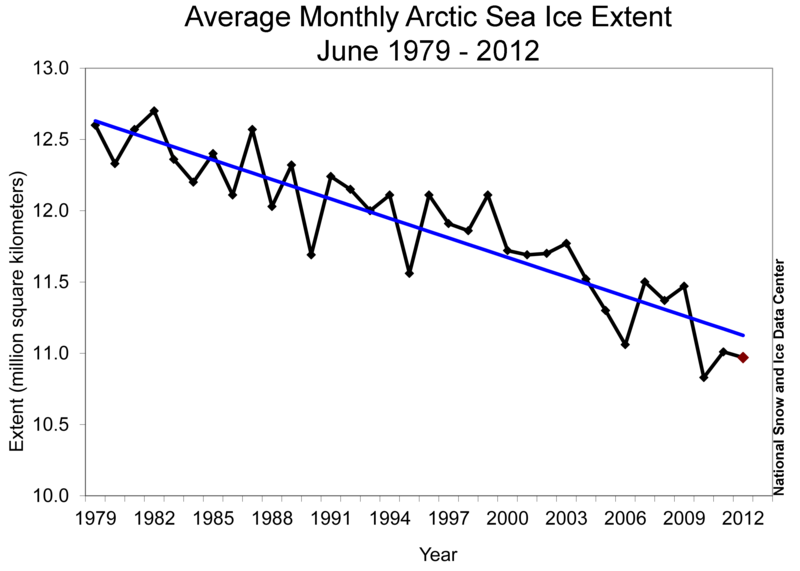 However, I gather that some researchers – like Peter Wadhams* – are now saying the Arctic could be ice-free in 5 years. Your Figure 5 lends credence to this assertion because it is very tempting to draw a curve through the points on the graph that would easily achieve that outcome. Extrapolation in Figure 5 is fraught with danger, IMO. The system is changing to rapidly for straight up linear projections to be valid – in any direction. If I had to hazard a guess, I would say within a decade, the summer in the Arctic will see a significantly ice-free ocean. I wouldn’t be surprised if it happened in 5 years, however. I would be very discouraged, but I think 5 years is well within the realm of physical possibility. The ramifications, of course, will play out every year after that.